...but maybe not this bit of seaside in July. We left the tranquil setting of Lake Orta on mid-Friday afternoon with a plan. It wasn't a very detailed plan, but then it didn't really need to be. We had made our minds up to reach France within the next week or so, primarily heading towards the French Alps since we love hiking so much and so that we could make use of the extensive network of aires (permissive camping spots) in France and hopefully keep our camping costs down a little during the high season. However, since neither of us felt like a long drive on the motorway we'd also decided get to France by a more indirect route, trying out some of the Italian aires first as we made our way slowly west towards the Italy-France border. Unfortunately we hit a snag as the first aire we reached after an hour of driving turned out to be a dodgy looking car park outside of a derelict warehouse with a police car parked next to some 'youths' in sporty looking cars. Hmmm, “we won't be staying here then” we said in unison. So we tried another aire half an hour down the road. This time it was another derelict warehouse with a deserted car park full of litter and no other campers in site, so we moved on again. The pattern repeated and by the time we'd visited our 5th aire (a trucker's stop) we were getting a bit desperate. It was 8.30, we'd been driving for 3 hours and we still had nowhere to stay. Fortunately we had a fallback plan. Esther had found one of the few remaining ACSI campings offering a discount rate until 15th July right on the Italian Riviera at Diano Marina. The downside was it was another 2 ½ hours drive away on the autostrade (which meant paying tolls) and it was getting dark. However, there was little choice except keep bouncing from aire to aire in the hope one looked OK which neither of us felt too optimistic about. We arrived at the coast by around 11pm, hot, bothered and ready to get some sleep (It was still 21 degrees!). Neither of us was expecting the sprawling mass of hundreds of campers that confronted us, looking more like a shanty town than the lovely campsite we'd left by the lakes just hours before. As we arrived there was no mention of this being a campsite, just a sign indicating a 'camper stop / area di soste'). After a brief argument with the rude man registering new arrivals at the gate (who, despite recognising our ASCI card, had never heard of the discounts this was supposed to entitled us to) we followed someone on a moped through the maze of campers to a spot where we could pitch, just next to a drainage ditch! Lovely. But we were too tired to argue any more so we levelled off as best we could and went to bed. After an equally rude reception lady who reluctantly compromised to some of the ACSI discounts, the day bought a little more optimism after a chat with a Belgian couple reassured us somewhat we would be OK here (the only other motorhome we could see which wasn't Italian of the 300+ crowded onto this patch of hillside). Besides we were both too tired to face another drive. We were here, on the Italian Riviera so we'd make the most of it an enjoy it. We took a nice stroll in the morning sunshine to the beach before the day got too hot. The beach was already heaving, with little free beach space between the hired out loungers covering the pebbly shore. Strolling along we tried to take in the sea and the breeze, but it was tricky in this alien landscape of tens of thousands of Italian holiday makers after the previous month of mountains and lakes. Eventually we passed the sunseeking hordes and found a pedestrianised section of coast road between Diano and the next bay which was better. Later on, we relaxed in the camper through the afternoon before heading out again in the evening on our bikes to get a little further west in the direction of San Remo to Imperia. On the bike the ride we got to see some money on display in the form of some huge yachts ("this time next year Rodney!"). We also found a quite bench overlooking the sea as the sun was disappearing behind the hills. Quiet, that was until the bar next to us started up its Saturday night disco with an excitable DJ playing to his crowd of 13. Day 2 dawned and we surprised ourselves a little by deciding to stay one more night. To avoid what had happened on our previous drive, we wanted to make a more detailed plan of our route in France to minimise the risk of getting stuck as we had looking for aires in Italy. After a morning jog along the sea we spent much of the day planning, between siestas and reading, before an evening stroll once the day had cooled. Although the coastline of holiday makers all merged together, we walked along Diano Marino through San Bartolomeo al Mer to Cervo. So now it's morning and we're about ready to hit the road again. 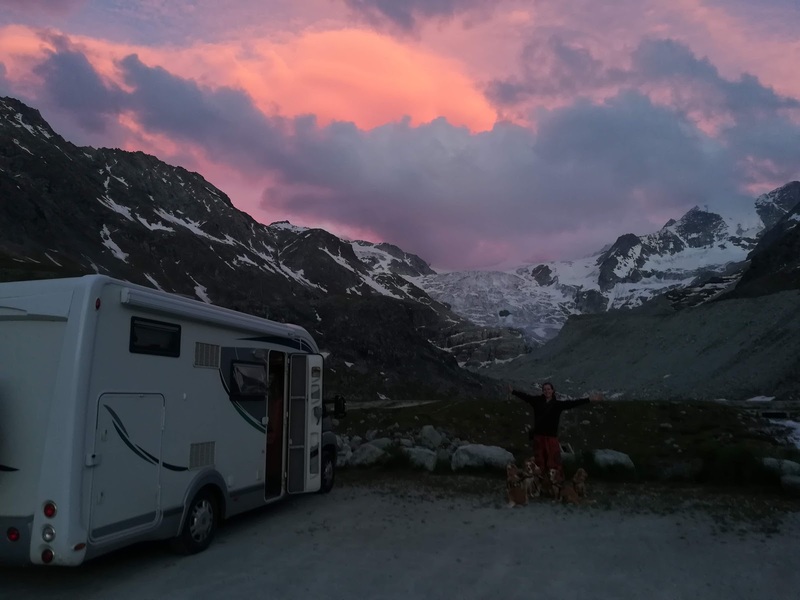 Although Diano Marina and particularly Oasi Park (camper stop) is the first place we've visited on our tour that we probably don't want to visit again, it certainly seems to be making lots of other people happy. If you like sun, sea, lots of gelato and eating out and don't mind the crowds then this is a good place to be. It's not quite our cup of tea, but we've enjoyed seeing the mediterranean sea again since our last trip in Septemeber and feel refreshed ready for getting our hiking boots back on in the French Alps.